Design Management is strategic design. A strategy is “a plan of action or policy designed to achieve a major or overall aim.” Synonyms are master plan, grand design, game plan, plan (of action), policy, program, tactics. Strategic is therefore “relating to the identification of long-term or overall aims and interests and the means of achieving them; carefully designed or planned to serve a particular purpose or advantage. Synonyms are planned, calculated, tactical, politic, judicious, prudent, shrewd. If the artwork below looks a bit like barrels of a gun, you aren’t misunderstanding my meaning. Design Management connects the world of design and the world of business via the study and application of Design Thinking methods. The program is focused on building the professional management capacity of individuals in design, marketing, service delivery, or business who want to lead in project management of communications, products, and services. Design Management powers systemic thinking and builds holistic understanding to address, solve, and implement solutions. Design management is a problem-solving process that enables innovation and creates well-designed products, services, communications, environments, and brands that enhance the quality of life and provide organizational success. Design management applies design thinking – a 6-step exploratory solution-finding process – to business problems. Leadership Working with teams and championing an idea. Strategy Developing concepts and design elements that align with a company’s core plan of action. Marketing Understanding product and package design, promotion, and physical plant design. Operations Identifying, understanding, and influencing efficient operational practices. Finance Comprehending annual reports, cash flow statements, and balance sheets. Legal Protecting an organization’s intellectual property like trademarks, copyrights, and patents. DM links design, innovation, technology, management, and customers to provide a competitive advantage across the “triple bottom line”: social/cultural, environmental, and economic (People, Planet, Profits). DM advocates design across an organization as a key differentiator and driver of organizational success. Design managers lead design firms and design teams in creative industries. DM incorporates design thinking, service design, and sustainability in the production and management of information, services, and experiences. The Six-Step Design Thinking Process: Approaches, Tools, and Methods This introductory course defines the 6-Step Design Thinking process to achieve innovative solutions that address the Triple Bottom Line: Financial Sustainability, Social Responsibility, and Environmental Sustainability. The course covers the variety of approaches, tools, and methods used in Design Thinking’s individual processes. Ethnographic Research and Expert Naiveté Students work in interdisciplinary teams with one client each semester. Empathy for the client and the client’s multiple constituencies lead to direct research of human needs and recognition of one’s own inherent beliefs. The course emphasizes team collaboration, leadership, and developing written and personal presentation skills. Environmental Sustainability Design Management has three core principles, the “Triple Bottom Line” that must be in balance for an optimal solution. One of the three, Environmental Sustainability, is examined in this course. Financial Sustainability Building on the foundation formed in Ethnographic Research and Expert Naiveté, students will again be grouped in interdisciplinary teams to complete an innovative, client-based project. An emphasis in this course is placed on financial profitability and sustainability in the context of the Triple Bottom Line. Research and Strategy This course addresses research methods in preparation for preparing a thesis proposal and the thesis itself. 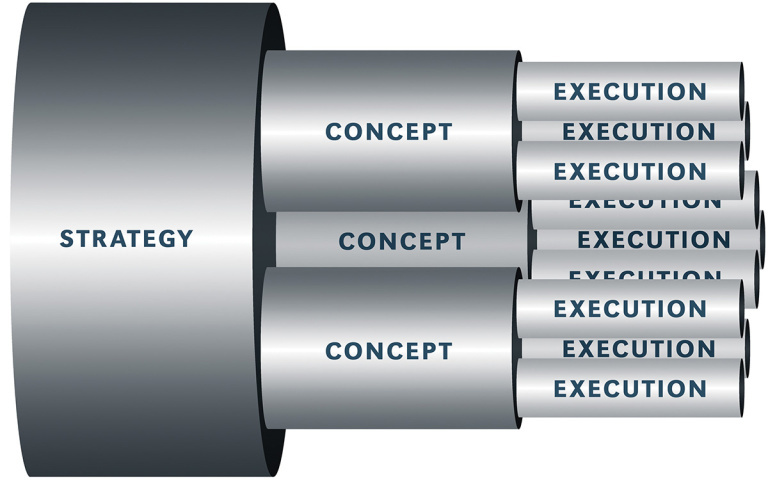 Strategy, an action plan to achieve a goal, is a significant aspect of the implementation of Design Thinking. Collaboration, Culture, and Leadership This course continues to equip students with the skills they need to work with cross-specialist teams on real world, client-based assignments. Students will focus on ways to collaborate, develop a culture of innovation, and be a motivating leader. The Triple Bottom Line: Thesis This capstone course requires students, working independently or in small teams, to research and write about an idea that explores and addresses the Triple Bottom Line. Theses discuss Strategy, Innovation, Profitability, Social Responsibility, Sustainability, Marketing, Leadership, Finance, Operations, and Legal. Innovation and Implementation This course places fourth-semester students in leadership positions on the collaborative teams, working with their team and with the other team leaders. Specific attention is given to the culture of innovation and the barriers to implementation. 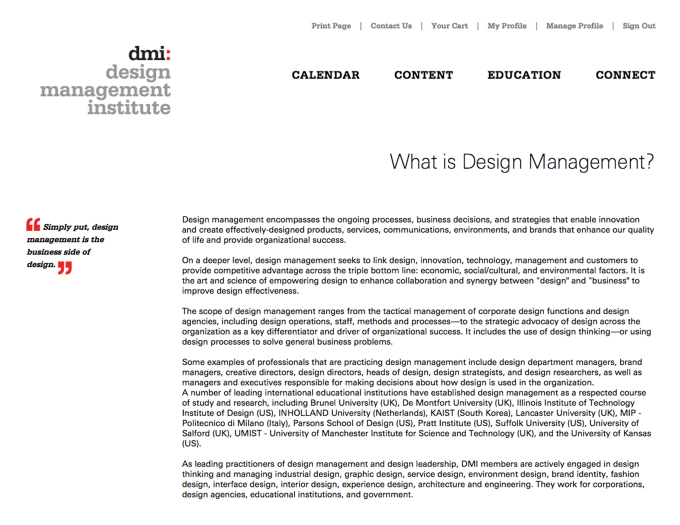 My interest in design management is as the chairman of the MPS program in DM at the Shintaro Akatsu School of Design (SASD – pronounced “sáss-dee”) at the University of Bridgeport in Connecticut. Our program has a maximum of 30 students and works with leading corporations in the Fairfield County area. I also work closely with the MBA program in Entrepreneurship at the Ernest C. Trefz School of Business at the University. You may reach me with academic concerns at alwhite@bridgeport.edu. The UB campus is directly on the shore of Long Island Sound. The Bridgeport/Port Jefferson Ferry goes past my 7th floor windows every hour, so it is natural to take the grad students on the ferry to visit the resort town of Port Jeff on Long Island. The trip encourages friendship and connection among the students, which in turn encourages classroom collaboration and team work in developing surprising business ideas that work in all three DM areas: human delight, ecological sustainability, and, of course, financial benefit.